Because I’m living in Michigan there seems to be no end to winter. I mean, I do realize that it’s barley March, but my friends in Salt Lake are already enjoying high sixties and sometimes seventy degree weather and I’m pretty sure that my family could be swimming in Arizona if they really wanted to. Do I sound jealous? Well if not, then I’m not writing this correctly because I am totally jealous. On Tuesday Mike and I woke up in the morning and he told me, “Make sure you and the kids dress warm today, Babe. It’s negative five outside right now.” I rolled over after rubbing my eyes and looked at him with raised eyebrows. “Negative five?” I questioned. “You mean, that’s like a thing?” He laughed and kissed me on the forehead. “See for yourself,” I handed him my phone. He held the phone for a while frowning, checking various websites and using the same website to check different areas on the map for differences in temperature. “Well one site says that it’s negative eleven and another negative fifteen so I guess it’s not too far off. Holy crap!” He shook his head and tossed me back my phone while I giggled and snuggled deeper under the covers. “Told ya,” I laughed feeling proud that he failed to contradict what I told him. I smiled until I realized that this still meant I had to face a morning of ridiculously cold weather. My laughter became a groan, “Ugh” and I laid my head back on my pillow. Umm yeah, needless to say, I’ve never experienced weather like the weather here in the midwest. Much to my dismay people that live in this type of whether don’t just wear snow pants daily so that you can hide extra layers of long johns and sweats underneath. Some women are still walking around in skirts, leggings, and designer boots! Well, for the record, when I got up I defied Michigan fashion, put on all those layers and topped them with snow pants anyway. You couldn’t see my figure, but at least I was warm. And after braving the cold weather when I finally got home I was able to enjoy a lovely bowl of soup. This soup is truly comfort food for any cold day. I like that it’s similar to potato soup but not so much that you can’t have recipes for both. 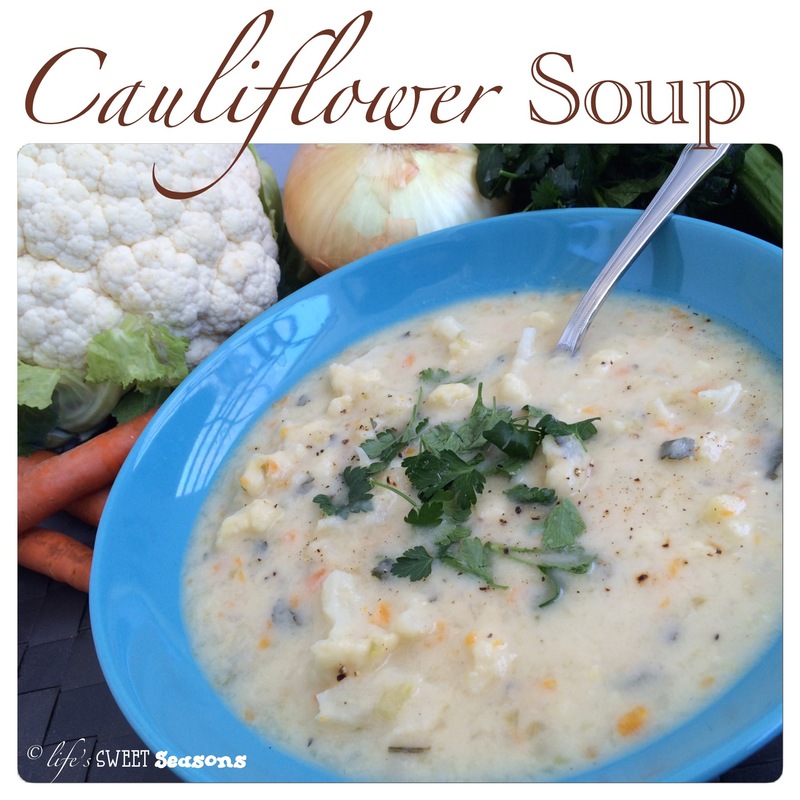 It’s also healthier than potato soup because cauliflowers have more nutrients than potatoes. I have always loved cauliflower since the time my Grandma Widdowson always made sure she had “white trees” for me when I was a little girl. 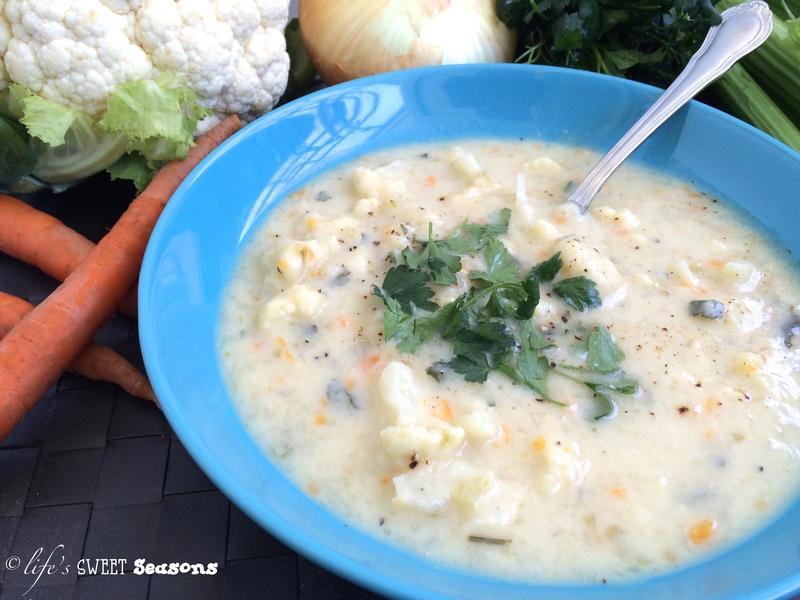 Before making this soup I was curious as to the health benefits of cauliflower and I was pleased to find out that cauliflower is high in fiber, vitamin C, vitamin K and a variety of antioxidants. The nutrients found in cauliflower help support digestive health, brain health, heart health, and it can even help fight cancer! Now my love for it can be somewhat intelligent rather than just based purely on taste. 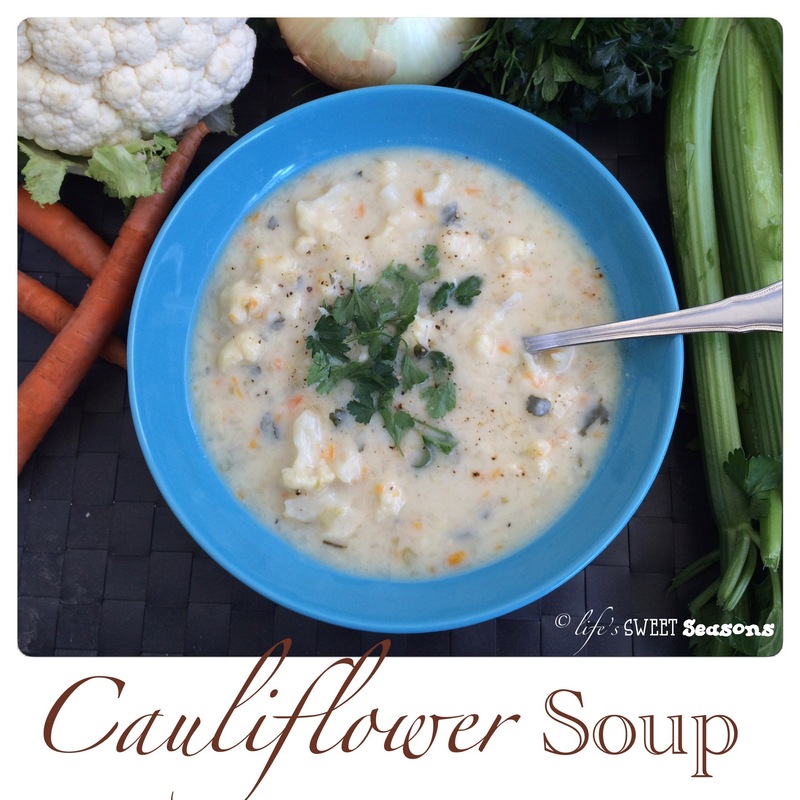 I looked at various cauliflower soup recipes online and they are all pretty similar. This one is adapted from the Pioneer Woman. Once again I have my friend Daisy to thank for getting familiar with Pioneer Woman’s recipes. I’ve only changed a few things that don’t alter the essential goodness of this soup. My version has more vegetables. I love onions, carrots, and celery so I doubled the amount she put in hers. I haven’t tried it yet, but I might even add more the next time and see how it goes. She adds cream to hers which I never just have in my fridge and this soup tastes perfectly creamy without it so my thoughts are, why add the calories? I hope you can try this soup and that you love it as much I do. Happy cooking! In a large soup pot or dutch oven, melt 4 tablespoons butter. Add the onion and cook for a few minutes, or until it starts to turn brown. Add the carrots and celery and cook an additional couple of minutes. Add cauliflower and parsley and stir to combine. Sprinkle with salt and pepper. Cover and cook over very low heat for 15 minutes. After 15 minutes, pour in chicken stock or broth. Bring to a boil, then reduce heat and allow to simmer. In a medium saucepan, melt 4 tablespoons butter. Mix the flour with the milk and whisk to combine. Add flour-milk mixture slowly to the butter, whisking constantly. Allow the cream mixture to come to a boil and whisk until thick. (About 5 minutes) If you use whole milk it will thicken quicker, but I use 1% so it takes a tad longer. Pour the white cream sauce into the larger soup pot while stirring. Add two bay leaves and let simmer 20 minutes. Check seasoning and add more salt or pepper if necessary. Garnish each serving with a tablespoon of sour cream and fresh parsley. Miss Lisa, I’m going to make this soup! It sounds yummy! I hope you enjoy it. And don’t be sorry, I’m so glad I made you laugh!